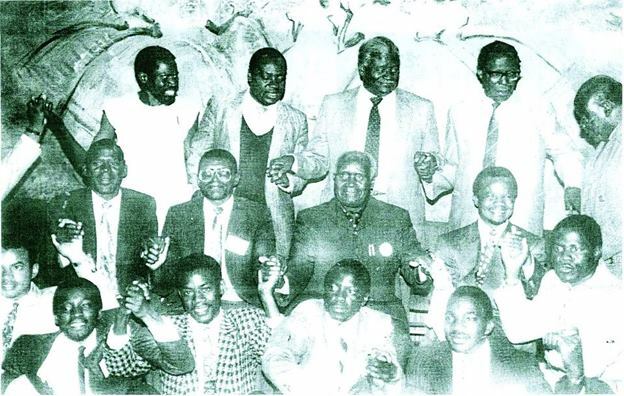 To fully discuss the birth of the MMD, one would have to go back to politics in Zambia before Independence and understand the interaction between ANC and UNIP, later after independence UPP and UNIP and then come to what led to the one-party state and then the opposition to KK during the one-party state. We won’t do that here, we will just remind ourselves of the actual outline of events around the formation of the party. Another day we can look at the food riots and the coup detats. Here goes …. The unsuccessful coup attempt in 1980 was the turning point in Zambian politics which would set off serious feelings of bringing Kaunda’s reign to an end. Another coup ten years later in 1990 sparked the change that brought back multipartism in Zambia and brought about the birth of the MMD. The coup attempt of 1980 was initiated by members of the country’s intellectual and business elite, who had played a leading role in the postcolonial civil service and state bureaucracy, but who became disillusioned with the takeover of the state and all business by the ruling party before and after the declaration of the one-party state in 1972. Most of these had separately opposed Kaunda since organized opposition was outlawed as most opponents of Kaunda like Kapwepwe and Nkumbula had been beaten into comformity or retirement. The Luchembe coup of 1990 and the Enoch Kavindele challenge for the UNIP presidency rattled the nerves of the indomitable KK and gave fresh impetus to advocates of multi-party politics, among them, the virtually unknown 32 year-old Edith Nawakwi , Akashambatwa Mbikusita-Lewanika (hereinafter sometimes refered to as Aka), Derrick Chitala (he would later change his fore name to Mbita Chintundya Chitala), Remmy Mushota and a middle-aged Harvard business graduate – Bob Sichinga. It was in 1990 that Nawakwi, daughter of the traditional leader of Nawaitwika village fell from the skies on the national scene. But this young woman did not just happen; she was a firebrand at UNZA and she had a history of student politics. She was a revolutionary UNZASU leader during the time Dr. Mwanza was vice chancellor. Afterwards she went to study for her MSc and Post Graduate Diploma in economics at Imperial College between 1987 and 1989. Like most people, she knew that food riots were taking a heavy toll on KK and that he was losing his grip. On a wind-swept Friday morning, July 20, 1990, at a nondescript motel about 15 kilometres west of Lusaka’s Central Business District, a meeting had been called to discuss the country’s future. The Garden House meeting, as it came to be known, would change the country’s destiny forever. The meeting had been called by a group of young professionals led by Akashambatwa Mbikusita-Lewanika and Derrick Mbita Chitala, Edith Nawakwi, Remmy Mushota, Bob Sichinga. The Gadern House meeting was initially planned to found a social movement, called Movement for Multiparty Democracy (MMD), whose main objective was to sensitise people on the need for a return to “full” democracy and specifically to campaign for a “yes” vote” in the referendum. This movement comprised mostly disaffected members of the UNIP government, some trade unionists, academics and other professionals, and the general citizenry. As a result, MMD was formed with no one individual or organisation providing the funds; it was team effort and supported by the whole community. Indeed people paid their own way to meetings and travel; there was no one who was ‘boss’ of the party. The meeting itself was open to the public and drew people from a cross section of society. “We suspect there were also people that came from the intelligence that might have infiltrated. They must have heard of it. I suspect that initially it was dismissed as another one-off thing by young people,” said Sichinga. Political gatherings were constitutionally banned then, and any such meeting would usually end in arrests. “We were not scared of the system; We said, as they would say, “cibe cibe”. But in the group we had invited, there were several individuals who were scared to come that particular day. And I can tell you that one of them was Dr Chiluba. He didn’t want to come that day. My information was that Mr. Chiluba was scared to come the first day because he thought he would be arrested,” he posited. “Many other people [stayed] away for fear of being caught in the dragnet and sent into detention at the whim of the great leader of the nation at the time. It should also be remembered that meetings considered ‘political’ were only allowed if they dealt with UNIP matters sympathetically,” Kashita added. However, Chiluba did show up on the second day when a committee of eight was appointed. The Gadern House Hotel meeting on its second day selected a committee called the National Interim Committee and was composed of the following (and their posts): (1) Chariman – Arthur Wina: former education officer before independence and first Zambian Minister of Finance, after; (2) Vice Chairman, Operations – Frederick Chiluba: rose through the ranks of trade unionism to be Chairman of the Zambia Congress of Trade Unions; (3) Vice Chairman, Information and Publicity – V.J. Mwaanga: former diplomat and editor-in-chief of Times of Zambia; (4) Chairman, Legal Affairs – Levy P. Mwanawasa: former Solicitor-General and in private law practice; (5) Security – Keli Walubita: former Deputy Commissioner of Zambia Police; (6) Transport – Andrew Kashita: engineer, former civil servant (Permanent Secretary, INDECO Managing Director) and Chairman of Amnesty International Zambia; (7) Ephraim Chibwe: former Director of Income Tax Department and diplomat; (8) Secretary – Akashambatwa Mbikusita Lewanika: economist, former Chief Executive Officer of Zambia Clay Industries. This was the interim committee whose members were prepared to be locked up or detained under the Preservation of Public Security Regulations. Fortunately for them, President Kaunda dismissed the committee as of no consequence because, apparently, apart from Arthur Wina, all the others were deemed to be politically unable to make any headway towards the objective. He underrated them and before he knew it, it had developed into an unstoppable force. The MMD’s campaign was country-wide and it became almost impossible for President Kaunda to detain any or all of the campaigners because the campaign were so spread and the reactions of the people of Zambia was overwhelmingly in support of the MMD’s objective. On November 17, 1990, unable to bear the extensive protests and growing public pressure to change the political system, Dr Kaunda realised the need for reform and he was forced to repeal Article 4 of the Republican constitution to allow for multi-partism – Article four (4) of the Zambian constitution as amended by Act No 22 of 1975 prohibited the formation or establishment of any other political party – the President approved and signed into law the repeal of Article 4. Effectively, this lifted the ban on political parties. This resulted in the quick formation of eleven new parties. Among these, the Movement for Multiparty Democracy (MMD), led by former union leader Frederick Chiluba, was the most important. According to Julius Omozuanvbo Ihonvbere and John Mukum Mbaku in their 2003 book “Political Liberalization and Democratization in Africa: Lessons from Country Experiences”, on Page 56, the National Interim Committee duly proceeded to the office of the Registrar of Societies to register the Movement for Multi-party Democracy as a political party and officially launched it in December 1990. It received its certificate of registration from the Lusaka City Council on 4 January, 1991. “Let them form their small parties.” It was Kaunda. That was one of his quotable quote when he was forced to reintroduce multipartism in Zambia in 1990. When the MMD was formed to go for the 1991 elections, it was not the only party that was formed following the repeal of article 4 of the constitution which brought about multipartism. Firstly there was the Movement for Democratic Process (MDP), led by Chama Chakomboka. He will always be remembered for his eccentric developmental ideas (Read Muliokela), which usually passed for jokes an not policy statements. The party would go on to participate in the 1991 elections and it would surivive until way past the next elections in 1996. I, Shalala Oliver Sepiso, remember voting for Chama Chakomboka in the 1996 general elections, which were the very first elections I voted in using that yellow NIKUV voter’s card at the UNZA Sports Hall – the largest polling station in Zambia! It was a protest vote. As a student leader at UNZA, I wasn’t about to vote for Chiluba but then again I wasn’t convinced by Mung’omba whose adverts using Michael Bolton’s song did little to dent Chiluba’s following since many thought only Kaunda could truly compete with Chiluba at the time. That’s a story for my book out next month or after next. Another party, named JADEPA (JAC Debating Party), was essentially a one-man party led by John Andrew Chama – a little-known Zambia Railways employee. On a cold Friday morning, at a high level all-party meeting called by UNZASU leaders to discuss the country’s political future, John Chama shocked everyone when he strolled into the hall at Mulungushi wearing a green perforated muscle shirt. (Those who knew the fashion of that time remember these vests which were worn with manzimanzi trousers tailored in the Wenge Musica style and moccasin shoes we called Shaolin). Even without a following, Chama had made his presence felt on the new political platform. He, however, never saw his name on the ballot papers. Just days before the elections, John Chama’s decomposing body would be discovered in his house in Kabwe where he lived alone. The party had died with his death. Another party, NADA, was formed shortly after the MMD had been transformed into a political party. It was led by Reverend Isaac Mumpashya. Mumpashya had been part of the MMD, but left to form his own party, arguing that he did not want the country to slip back into a one party state under MMD. But NADA, which was also known as the paupers’ party, had no future and would embarrassingly crumble shortly after the elections. Although none of the other political parties had any impact, they were still confirmation of the new democratic political system. After pressure for the new parties and clear public support in favour of the restoration of multi-party democracy, President Kaunda cancelled the referendum in favour for direct multiparty election and instead announced constitutional changes for a return to multi-party politics. Kaunda also went on to set October 31, 1991, as the date for multi-party elections. The MMD, led by trade unionist Frederick Chiluba, would go on to win the elections and Kaunda, in a rare act of benefaction, handed over power peacefully.